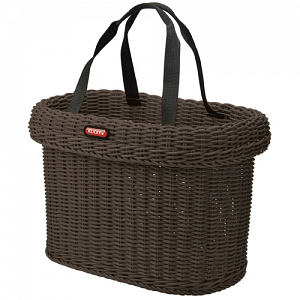 This meshed basket unites traditional design with modern material. The robust, polypropylene-based Saleen - fiber is woven by hand according to traditional modes of basket-making. The raw material looks and feels much like natural fiber, yet is set apart by several advantageous qualities: it is resistant to weather, UV-rays and will not turn grey or become brittle. A strong metal frame connects the basket to its KLICKfix handlebar adapter, where it is simply snapped into place and can be removed within seconds. Please take maximum load of the chosen adapter into account!